The perfect way to make your geocaching pack or jacket trackable! This patch includes the official Geocaching Travel Bug® icon with the words 'trackable at geocaching.com'. Securely attached to the bottom of the patch is an engraved metal strip with a unique tracking number. 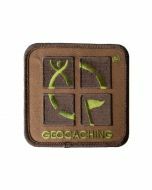 The perfect way to make your geocaching pack or jacket trackable! This patch includes the official Geocaching Travel Bug® icon with the words 'trackable at geocaching.com'. Securely attached to the bottom of the patch is an engraved metal strip with a unique tracking number. Available in Charcoal & Blue. The back side of the patch will attach to soft Velcro or you can sew it to whatever you choose to make trackable. 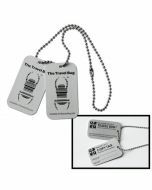 To learn more about the Geocaching trackables, visit this website. Dimensions: 40mm by 80mm (3 1/8 inches x 1 5/8 inches).